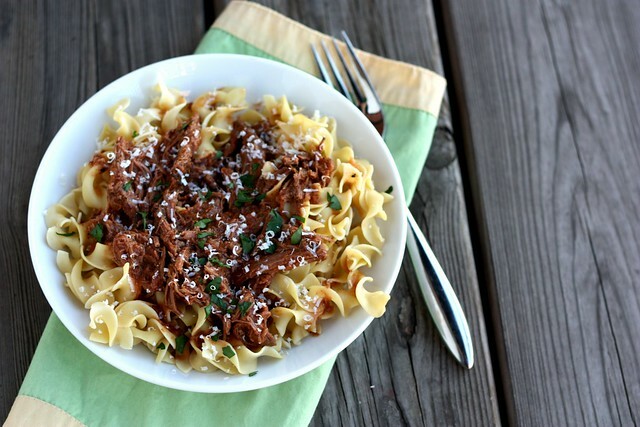 Slowcooker Makaronatha (Greek Beef Ragout) – Elly Says Opa! I’ve been making a concerted effort to use my slowcooker more frequently and, in general,I’ve been highly rewarded. Although I don’t think I’ll ever be one of those people who can use their slowcooker for nearly anything (I really do get confused by some of the stuff people make in theirs), I always appreciate an extra recipe to add to my arsenal. The ones that have been successful over the last year or so have been really successful, and I find myself making them or versions of them pretty frequently these days. I try to get dinner ready as soon as humanly possible after work, because my son has taken to talking foreeeeeever during dinner, which means we spend a lot more time at the dinner table than I’d like (so the earlier we start eating, the better). Given my interest in using the slowcooker combined with my knowledge that it’s the perfect vessel for anything that will result in shredded meat of some sort, it’s really weird that I never thought to make this before. We make this “makaronatha” or pasta dish pretty frequently the regular way—which basically means braising chunks of beef in a spicy (allspice-spicy, not pepper-spicy) tomato sauce for a long time, and then eating the really tender, flavorful bites over pasta loaded with aged myzithra cheese (okay, and some butter, too). This dish works particularly well in the slowcooker because it has very minimal prep work. The spices are so perfect and warm for this time of year (though I’ll take them anytime), and the beef is fall-apart tender, so it’s ideal for shredding and serving with pasta (but feel free to pair it with polenta or a favorite grain). I loved coming home to the familiar smells of this dinner, and knowing all I had to do was boil some pasta to eat it. Zachary is always a fan of “Greek-style” meats and sauces, because he also loves allspice and cinnamon, so this meal was a winner for him, too. I highly, HIGHLY recommend myzithra if you can find it, but if not, a slightly strong, salty cheese like a good quality Pecorino Romano will work well, too. 1 beef roast, about 2.5-3 lbs. Season the roast liberally with salt and pepper. Heat a large, heavy bottomed skillet over medium-high heat and add the oil. Place the roast in the hot oil and brown well on all sides. Move to slow cooker. To the pan, add the onion and saute for about 3 minutes before stirring in the garlic. Add the tomato sauce, broth or water, and salt and pepper to taste. Scrape up any browned bits from the bottom of the pan, and then pour the mixture over the roast in the slow cooker. Add the parsley, cinnamon stick, bay leaves, and all spice to the slow cooker. Cook on low for about 8 hours (longer is absolutely fine). Remove the cinnamon stick, bay, and allspice. Shred the meat and season to taste if necessary. If you want, make a corn starch slurry, turn the slowcooker to high, and add it at the end for a few minutes to thicken up the sauce. *Note: I like allspice, a lot, so I use the high end (maybe even more). You could also use ground allspice, and I would start with a scant 1/2 tsp., adding more later if you want.